The aim of normalisation is to reduce your data from a long list of fields to a set of related tables whilst ensuring the integrity of the data and eliminating duplicated data. Duplicated data is known as data redundancy. This can occur in two ways in your database. Firstly, redundant data is data that is stored twice or more in the database. For example, if in your database you are storing the items sold by a company with multiple branches. One way of doing this would be to have a table for each branch with the items that they sell. However, most branches will sell a majority of the same items. Therefore, if there are three branches you will have every item stored three times! Where is my Critical Path? So just where is my critical path? CPA is a planning and project management tool that we use here at LSITS to ensure a project is completed as quickly as possible, and resources used as efficiently as possible. It is vital that the information obtained at the start of the project is accurate and therefore we take time out to understand our clients requirements and make sure that everything is captured. In the diagram above the duration of each activity is listed above each node. For each path, add the duration of each node to determine its total duration. The critical path is the one with the longest duration. There are three paths in the example diagram above. Help you identify the activities that must be completed on time in order to complete the whole project on time. There is a great misconception that once you have a Gantt chart, you’ve cracked it, you have a plan and the project management for your business critical project is done. Even in today’s business world, I am not always convinced that everyone really understands the significant role that the Gantt chart plays in managing projects. Ok, so if it’s not just about producing a set of visual boxes, calling it the project plan and flashing it off at the next executive meeting, what is so special about the Gantt chart? The Gantt chart is actually a very powerful tool for managing the progress of a project and if used effectively, can provide sufficient warning of project slippage. This is part 2 of our "what is an apprentice? blog. Read part 1 here. In the previous blog post we looked at what an apprentice is and the history of apprenticeships in the UK. In this post we will look more at the practicalities of being an apprentice, what you could learn and what you could get at the end of the scheme. That will depend on what sector of industry you decide to go into. Traditionally apprentices went into the construction industry to become Electricians, Welders, Plumbers, Carpenters, Brick Layers and so on BUT the world of work is far more diverse now and so the sectors you can enter into are very varied. 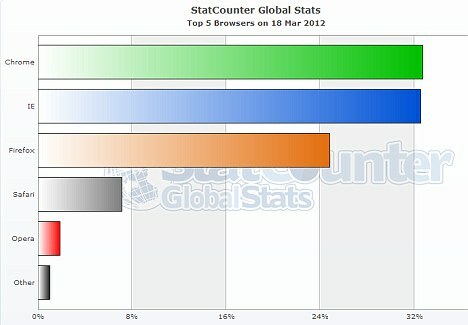 March 2012 marked the first time a browser other than Internet Explorer sits atop the rankings and could call itself the king of the browsers (at least according to the data provided by StatCounter). Chrome has slowly been cannibalising users of Internet Explorer and Firefox (as well as the other popular browsers no doubt) and its steady growth now puts it ahead by the smallest of margins. While the data might not be 100% accurate due to the possibility of people masking what browser they are using with user agent tampering or other similar methods it can safely be assumed that the pattern being observed is probably correct. It might have only have claimed this title for one day but this pattern clearly shows that Chrome is continuing to grow in popularity and will no doubt be sitting atop the browser throne full time soon.